We've already given out Most Improved Retail Selection: Barriques in Madison. With the hiring of a beer specialist, and the subsequent surrender of the beer buying to David Sanborn, Barriques has turned their Fitchburg location into a great "singles" bar. Best Experimental Beer: Grumpy Troll Iced Maggie. An "ice cured" IIPA that took advantage of the multiple sub-zero days that froze Wisconsin last winter. Best Beer Bar (Madison): The Malt House, Madison, WI. Yeah, I know, I initially derided it's lack of anything to do, but it's singular focus on beer (and now scotches and whiskeys and bourbons), its dedication to reasonable prices, and its workday ambiance make it a mecca for beer buffs passing through the city. Best New Release: Furthermore Oscura. More iced coffee than espresso mud, it showed a great playfulness and exceptional skill to pull off a flavorful, different summer brew. It is a beer that will distinguish Furthermore for a long time. Best Seasonal: Central Waters Bourbon Barrel Cherry Stout. A big, bold flavorful beer that is like drinking a cherry cordial with immense malt complexity. We should consider ourselves lucky that we can get this here in Wisconsin. It's only a pity that Central Waters doesn't package this in a 22oz bomber or, even better, a caged and corked 750ml bottle. Best Special Release: Lakefront Bridge Burner. A different kind of beer for Lakefront, it is a great effort from a brewery that has a lot of flexibility to experiment in the upper end now that their everday lineup is firing on all cylinders. Best Year-Round Release: Rowland's Calumet Oktoberfest. Always available. And, to my mind, the single best beer you can find every single day of the year anywhere in the world. And, no, I'm not exaggerating. Best Beer 2008: Ale Asylum Mercy Grand Cru. Is it a blonde? A tripel? A quad? Who cares!? It's great. Big and bold and flavorful, it is great to finally see Ale Asylum start to unleash some of their Belgian beers on the public. Best Brewery 2008: New Glarus Brewing Company. They just keep getting bigger, but they just keep getting better, too. Unlike other breweries that struggle to maintain quality as they get bigger, New Glarus has not missed on a single beer all year. The Unpluggeds were unparalleled and the new Alt really shows that New Glarus has something to add to the worldwide beer conversation. Best Brewpub 2008: Please vote for Best Brewpub in the poll to the left there. Polling will be open until February 28, 2009, then we'll tally it up and announce the results. What did happened at MBR last year? Well, we joined the Facebook crowd. Come check us out, get the latest MBR news and some exclusive Facebook content. 2/4/2008 - This Imperial Post - a post praising the fact that "Thankfully Wisconsin breweries are mostly free of the habits of others to develop 'imperial' version of beers that are in no way 'big' beers." Only to have a number of Wisconsin breweries turn around and produce "imperial" wheat beers, "imperial" alts, "imperial" rye porters, "imperial" saisons, and others. In the exact same post I lamented the fact that Stone Brewing Company was not available in Wisconsin.Then, later in the year, to much fanfare, Stone's beer became available here. 7/9/2008 - Drinkability - The Milwaukee Journal-Sentinel had run an article about Stevens Point Brewery and mis-applied the definition of "drinkability" - and we drew the distinction between "drinkability" (do you want another one) and "sessionability" (do you want another one right now) and talked about how low drinkability is not necessarily a bad thing and high sessionability is not necessarily a good thing; little did I know that Budweiser would soon take this same misapplication to a whole new level. 5/29/2008 - Anheuser-Busch is purchased by InBev. While this doesn't seem to have much impact on the craft industry, it will, in all likelihood, actually end up being good for craft brewers as InBev will turn Budweiser into more of a global brand with less particular emphasis on the United States market, thus opening up some marketing room for the craft industry. We talked about New Glarus' Oraganic Revolution and the Adnams' Green Beer and the meaning of Organic; we even saw City Brewery in LaCrosse using its Biogas to add energy to the grid. Then, at the beginning of the summer we looked at Dave Anderson's BrewFarm - a sustainable farm and brewery being put together in Wilson, Wisconsin. Then agriculture really started rearing its head in late July. We had posts on the use of local wheat and other Wisconsin grains (for example in the Minocqua Wild Rice Lager). Then we had two posts in October about agriculture, commodification, and geographic indications. We raised this issue again in November when we talked about Ale Asylum's Mercy Grand Cru. As the craft beer industry becomes more and more sophisticated these issues are going to keep coming up; this year laid a good foundation for that discussion. Wisconsin took a lot of flak this year for being number one in the nation in binge drinking. Again. We talked about this in the context of beer taxes on a number of occasions. We discussed alcohol content and the misnomer of what a "drink" is. We talked about what happens when the appropriate serving size is mistakenly a pitcher. We even proposed a solution that appears to have at least the support to debate its merits from college and university presidents: lower the drinking age. Of course, to throw wood on the fire, the University of Wisconsin announced they were going to start teaching college kids how to by-pass the bars entirely and brew their own beer for class credit. And then finally, it was "officially" made a big deal by both the New York Times and the Milwaukee Journal-Sentinel. Next post we'll cover some MBR Awards for 2008. Last year, Furthermore's Brew Ha Ha at the High Noon Saloon saw the release of Makeweight, a Belgian-y, American-y, ale-ish sort of thing. It ushered in a great year for Furthermore that brought the release of Oscura to kick off the summer, in addition to the continued success of their other regular beers. And, as a side note, just to note our own prescience and as a way of hyping up next week's content - we were right about Furthermore being one of the breweries to watch in 2008. At 10:30 or so, we will tap the inaugural keg of "Thermo Refur", a freaky Aran Madden creation involving bretanamyces, organic red beets, black pepper and some black malt for a high-alcohol, used band-aid sort of vibe. We considered "Red Menace" and "Fugly" as names, but settled for a simple cheeky anagram. We are only releasing a small quantity of this beer in kegs. We're guessing it's not going to be for everyone (sort of like sea urchin or a root canal), so there will also be three other varieties of Furthermore on tap. OK, Furthermore and black pepper, check - good stuff, can't go wrong with a proven favorite. But from there, the imagined taste sensation just takes off into WTF-land. Black malt. Black malt. Black malt. Deeply roasted. Burnt. Earthy. Coffee-like. Bitter chocolates. Okay. I can wrap my mind around that. Add some pepper and it's tasting a little like Queens of the Stone Age - dark and heavy riffs that just take you deeper. Organic Red Beets. Let me repeat that, for those of you who think you didn't read that right the first two times. Organic Red Beets. Red f-ing Beets. Now. This is interesting, because I hate beets. Hate beets. There is no part of my palate that even feigns to tolerate them. Yet, here they are. In a beer. Is this the first commercial beer to ever use beets? Not beet sugar. Beets. The sugar content, like the traditional Belgian candi sugar, should throw the sweetness and alcohol into the stratosphere. Like a ripping violin arpeggio on top of the menacing thunder of black malts and pepper. Brettanamyces. Sorry to correct your spelling there Chris. The wee little beasty charged with turning your beer sour. Lambic/geuze, oud brun, and flanders reds all use this peculiar and notoriously unpredictable yeast strain to impart sourness. So, that thundering black malt and black pepper, that stratospheric violin of beets; yeah, play those in a minor chord. Given that new brett beers can be a little harsh, is there an oak-aged version sitting around somewhere? Will we have an oak-aged Thermo Refur in three years? The possibilities are tantalizing. Oh. And the name. "Thermo Refur" - a nice throw to Lake Louie's "Liquid Reefer" which we all know and love as "Louie's Reserve" - and slyly put, to fool the labeling nazis, as an anagram of Furthermore. So head on out to the High Noon on January 3 and take part in one of the very few opportunities you'll have to get this stuff on tap. At $2.75 you'll be able to figure out whether it's more "used Band Aid" or Beethoven. For part two this week we've put together our favorite clips from 2008. Enjoy the memories and lively commentary. Today is December 24. Don't you have anything better to do? Shopping, for example? For those of you who celebrate such things, Merry Christmas. For others who celebrate other things, enjoy your Chinese dinner. For everyone else, enjoy the days off of work. If you work in the service industry and have to work tomorrow, sorry about your luck. For the next week or two, really until after the New Year we are going to be on auto-pilot. That doesn't mean we won't have content, because we will - in fact, we're going to have some really good content. But, if we aren't the most timely, please excuse us. On Friday we'll run a brief piece about the first event of the New Year that is rapidly turning into a pretty badass release party. Then all next week we will look back on 2008, with a review of some of the silliness that has gone on here on the site. We'll also hand out some awards for 2008. Finally, we'll take a look at things to look forward to in 2009.
ps. do people even say that anymore? Sorry for the lateness of this post, it's been one of those days, you know? Part one of this weeks podcast features news in 60 seconds, covering the Great Dane/Capital Brewery's attempt to create the biggest all malt beer ever, Australia's first no-carb beer, and AB-InBev loosing it's EU copyright battle [ed note: I think they mean 'losing its EU trademark battle']. You've probably seen it on the shelves for $15 for a six pack. That probably seems like a lot. $2.5 per 12 oz. bottle is much more than we are used to paying for beer. Heck, Autumnal Fire is $9.99 for a six. New Glarus' Alt is only $7.99. PBR is, what?, $5.00? I'll do some math for you: $15/six comes out to about $.2083 per ounce. Which, if we do our handy, dandy conversions is about $4.58 for a 22oz, or $5.28 for a 750ml. Well, that doesn't seem quite so expensive now, does it? Which, to me, seems like a weird way to sell beer. $15 seems like a lot for a six pack. But we don't blink at $5-7 for a 22 or 750. In fact, it's not really until the $10 mark that we really start to evaluate the "value" of a 22 or 750. With that said, why aren't Wisconsin brewers bottling these more desirable beers in different package sizes that provide much higher margins? I mean, as a consumer, hey, great, I'm all for it. But it seems like there is a huge missed opportunity here. For example, what if Tyranena released its Brewers Gone Wild Series in 22oz's instead of four packs? Four pack = 48oz. It sells for about $9.99 for a four pack, or, magic of magic, $.2081 per ounce. The Brewers Gone Wild Series are always in high demand, so let's assume Rob will sell all of the beer that he brews under the Brewers Gone Wild. If instead of $9.99 for a four-pack, he sold his BGW's for $6 in a 22oz package size, that translates to $.2727 per ounce: 23% more income without exceeding consumer expectations in the slightest. Yes, the 22oz bottles are slightly more expensive, but they use standard caps. And, really, are they $.06/ounce more expensive than 12oz bottles? And that's assuming a relatively reasonable $6 for 22oz bottles – Three Floyds sells for $9 or $10 for their regular beers; Rogue sells for $6 for their regular beers. Etc. For Central Waters, perhaps the Coffeehouse Stout is an experiment to see how well the package size sells? In the meantime, we're left with 12oz bottles of the Bourbon Barrel Stout (BA, A-; RB, 98). Summary: a great beer that is rapidly becoming the hallmark and calling card of Central Waters – a reputation maker and a business sustainer; a damn fine beer. Madison Beer Review is slowly being dragged into the new century (we'll ignore for the moment the fact that we were created in the new century). We have officially formed a Madison Beer Review Facebook page! I have no idea where this is going, but become a fan, post some comments, post pictures of your beers; heck, we might do some Facebook exclusive content - you never know. In the meantime, you can put a profile to all of those people out there who comment. It's possible you already know one of them. Plus, it'll make it easier for you to know when MBR is doing events around the state. Next up, mastering the Twitter. Frank Beer bought H&M Distributing: Frank Beer is the Dane County area (near-northern and near-western counties) distributor for breweries such as New Glarus, Tyranena, Lake Louie, Furthermore, Central Waters and Stevens Point; Frank also distributes PBR and Old Style among others. Frank has purchased H&M, a distributor mostly focusing on Miller products including Leinie's and Peroni and non-Miller products such as Labatt and Heineken (Labatt and Heineken are not SABMiller products, but does Miller import them?). As Frank takes over H&M's clearly non-craft segments, perhaps these buyers will find some room for the Wisconsin crafts. In other industry news, A-B InBev has lost its battle in the EU courts over rights to the trademark Budweiser. This litigation has been going on for a very, very long time. It all got started because there is place in the Czech Republic, back when it still a part of the Holy Roman Empire, called Budweis. The town of Budweis has a brewery which produced a beer called, predictably, Budweiser (the English bastardization of "Budějovický"). Well, as we are well aware, the United States also has a brewery that produces a beer called "Budweiser." There is some dispute as to who started first and when, but the end of the story basically goes like this: Anheuser-Busch has prevent Budweiser from entering the United States under the name "Budweiser"; so, here in the United States, Budweiser, also called Budvar in the EU, goes by the name Czechvar. Well, until a few days ago Anheuser-Busch's Budweiser had been approved by the EU. No more. However, in a weird quirk of the EU, this ruling does not really effect any decisions or registrations that already existed in the individual member states. Basically, an EU mark is kind of a "default" state that exists unless the individual member state varies the default; where the two are in conflict, the general rule is that the member state's rulings and registrations prevail in the member state. Hopefully that makes some sort of sense. Part two of our blind Christmas Ale tasting, including Great Lakes Christmas Ale, Summitt Winter Ale, New Belgium 2 Below Winter Ale and August Schell Snowstorm. I don't mean to pick on the Green Bay Press Gazette - theirs just happens to be the article that I read after hearing a number of radio reports about this. Wisconsin District Attorneys want to raise taxes on beer and other alcohol to help pay District Attorneys. Two prosecutors in the region say they support a proposal to raise the state's beer and liquor taxes to pay for more prosecutors. Calumet County District Attorney Ken Kratz and Waupaca County District Attorney John Snider say their offices could use additional prosecutors. ----Has Mr. Kratz talked this over with others in Calumet County? I find it odd, or maybe not, that a County DA in Calumet County of all places would want to risk his elected position in the home of one of the largest malting facilities in the United States. Not to mention the brewery across the street. The Wisconsin District Attorneys Association, saying there is a link between alcohol abuse and criminal behavior, is asking the Legislature to approve a "modest" increase in alcohol taxes to fund prosecutors' pay raises and 121 prosecutor positions it says are needed to handle a growing caseload statewide. ----There is also a link between drug abuse and criminal behavior, between education and criminal behavior, between genetics and criminal behavior, between environment and criminal behavior, etc. etc. etc. A lot of things contribute to criminal behavior, but Gov. Doyle cut the funds to the District Attorneys and now they're scrambling, I get that. But taxing beer because it contributes to criminality? Please, why not tax bowling alleys because criminals meet there? ----Now look, I'm an attorney. I fully support the idea that DAs need to be paid better. I think it is criminal (there's that word again) that this state gives its public officers barely inflation increases (often not even that!) for jobs that start out poorly paid to begin with. Yeah, I know, boo-hoo for the guy making $48,000 a year. But when 1/3 of that goes to taxes, then 1/3 of the remainder (if you're lucky!) goes to school loans, these attorneys are left with less than $25,000 with which to pay for housing, cars, and other living expenses. And for that awesome salary they have to work endless hours with ridiculous case loads against defense attorneys with years more experience, in a job that only draws notice when it is done poorly. It's a terrible life. They should be paid better for it. But there are options other than taxing a tentatively-linked product at best. Lobby the federal government for student loan relief for public service. Lobby the state for tax relief. But to tax beer and alcohol? Wisconsin's beer tax — the third lowest in the nation — hasn't gone up since 1969. The liquor tax, among the lowest nationwide, hasn't increased since 1981, other than when a new tax on hard cider was added in 1997. Wisconsin's 6.5-cent tax per gallon of beer is two or three times less than what neighboring states charge. The tax is 14.8 cents in Minnesota, 18.5 cents in Illinois, 19 cents in Iowa and 20.3 cents in Michigan. ----They also have lower state income taxes than Wisconsin. We pay more on income taxes, they pay more for beer. So what? "For years, the state budget process has placed prosecutors at the back of the line to the detriment of public safety and crime victim services," said Ralph Uttke, Langlade County district attorney and president of the WDAA. ----Hear Ye! Hear Ye! The man speaks the truth. The prosecutors' proposal drew opposition from the Tavern League of Wisconsin, which represents bars. It doesn't make sense to raise the beer tax and earmark that increase for a specific budget item, Tavern League lobbyist Scott Stenger said Monday. "That's not the way state government works," he said. "We think it's a bad precedent, and if there's going to be a discussion on taxes, it needs to be more global." ----Mr. Stenger is absolutely right. That's not how the state government. We don't publicly debate things and come to some amicable solution before putting reasonable bills that care for the public interest! Mr. Uttke should just do what Mr. Stenger and the Tavern League does and make the public discussion more "global" and theoretical and then surreptitiously buy-off legislators who will get the bill added at the last minute to an over-due budget. That way you can short-cut this whole "debate" thing and get the solution you want - geez, haven't you heard the phrase "It's easier to ask forgiveness than permission"? The WDAA resolution also supports using additional revenue generated from the alcohol tax increase to fund law enforcement, crime victim services, community outreach, prevention and education, and other programs designed to decrease crime in Wisconsin. ----How much do they want to raise the damn tax!? That's a lot of "additional revenue". Plus, what do they want to do about Tereca Berceau's Beer Tax? Is this in addition to her crack-pot idea or is this support and extension of her crack-pot idea that we've put holes in time-and-time again? "Any funding source we can find to help get more prosecutors makes sense," said Kratz, who noted that he could use a second assistant district attorney, but wouldn't request one until area counties with worse shortages get some help. ----That's so noble of you Mr. Kratz. This week we got festive with blind tasting of Winter and Christmas beers from some of the best breweries in the country. Part one includes tastings of New Holland Cabin Feaver, Anchor Christmas Ale, Rogue Santa's Private Reserve Ale and Goose Island Christmas Ale. Stay tuned for part two on Thursday. Does Part II include the juggernaut of Great Lakes Christmas Ale? You'll just have to wait until Thursday to find out. Well, today we stay with the coffee stout, but move up-state a little to Amherst, WI where Central Waters is located. The roasted notes of coffee and the roasty, chocolatey, winey, full bodied warmth of the stout seem to go perfectly together. So while the occasional brewery might combine coffee with, say, a Mexican lager, the usual course is to combine coffee with a stout and many breweries make their reputation on just such a combination. Flavor: coffee bitterness is immediately obvious, but there's some background dark chocolatey-ness to it as well, it is followed by a fast-paced alcohol and hop finish – where Bear Republic's Big Bear Stout sets the standard for hoppy beer with an amazing cascade hit, Central Waters has a nice, big, powerful hop finish that's nowhere near a hop-bomb but is thankfully not brash cascade hops. Summary: The hops were somewhat surprising and really help to compound and accentuate the coffee and chocolate bitterness, bringing out both of those flavors in a more pronounced manner than the malt bill alone would accomplish; it is a nice, big thick beer, which while pairing nicely flavor-wise, doesn't really make for a light meal when paired with a hearty, spicy beef chili. The second part of this week's show has news in 60 seconds, with discussions of the proposed British happy hour ban, Goose Island keeping it's original location, and Bell's partner brewing with De Proef. Intrigued by Dogfish Head, the bold and adventurous brewing company out of Delaware? Ever wondered what beer fermented in barrels made of Palo Santo wood tastes like? Want to taste a beer continuously hopped for over 90 minutes? Ever had a Berliner Weisse with a hint of peach? How about a sip of a beer based on the "earliest known alcoholic chocolate drink used by early civilizations to toast special occasions"? Star Liquor, at 1209 Williamson Street, in Madison, is hosting Dogfish Head for a tasting between 4pm and 7pm on Friday, December 12. As part of our effort to start incorporating more Milwaukee breweries here on Madison Beer Review, we turn now to Lakefront Brewery. Famous for their brewery tours. Russ Klisch, the headbrewer at Lakefront, has made his brewery a stalwart of the Wisconsin craft brewing industry. Russ is also well-known for his fight against Budweiser over organic standards in brewing. Quickly, as a background, the basic gist is this: the USDA certifies foods organic; of course, very few processed foods can be made absolutely, 100% organic - some base component, say salt, a minor component of most foods, is just too impractical or costly to obtain organically (we will, for purposes of this article ignore the logical retort of "so what? "); in any event, the USDA publishes exemptions for non-organic products that can be used in foods that can still be certified as organic. So, OK, to the fight: Budweiser wants to add hops to the "exemption" list. Their argument (Budweiser's) is that hop material comprises a very, very small percentage of beer. But, Russ pointed out, hops are integral to the very essence of beer, to exclude them would be "a threat to organic certification at best, and intentionally misleading to consumers at worst." Using non-organic hops in an "organic" beer is not only a cheap shortcut, it's intellectually dishonest and, as Russ points out, is misleading. Anyway. The point is, Russ is one of the good guys fighting the good fight for craft brewers here in Wisconsin and in general. We'll see in future posts just how innovative Russ is. But for now, we'll just say he's got some really interesting cards up his rolled up sleeves. One of those interesting things is a partnership with local Milwaukee Riverwest coffee roaster Fuel Cafe. He's used their coffee in a stout to make his Fuel Cafe Coffee Stout. This week we spoke with Dean Coffey, brewmaster and owner of Ale Asylum. We discuss his beginnings as a brewer, his split with the Angelic Brewery, his set up, the controversial SB224 brewpub law, his new beer Mercy, and more. There are three issues we should address before we get to the review. First, why age beer; second, what is the effect of aging; third, how do you age a beer. The first issue is why in the world anyone would cellar, or age, a beer. We typically think of beer as something to pound in quantity straight out of the bottle, or, if you are lucky and skilled enough, out of a funnel, or, perhaps while standing on your hands above a keg, or maybe, maybe, to put into a chilled pint glass. Heck, many beer manufacturers put "born on" dates and "best by" dates on their beer. We talk about beer getting skunked. We talk about beer going bad. As the kids might say, WTF?! Why would voluntarily save a beer? In some cases beer does, in fact, go bad. Hops can have undesirable effects when exposed to some kinds of light over a period of time – which is why we have to be careful about clear bottles; there is some debate that Heineken's green bottles are not particularly good at shielding beer, either. But, that is not the kind of "going bad" that we are talking about. What we are talking about here is the effect of time on a properly stored bottle (or can) of beer. And, in many cases, the effects are very, very pleasurable. In other cases, the effects are very, very unpleasurable. It just so happens that the beer manufactured by those that put "born on" dates and "best buy" dates on their bottles does not keep particularly well. The effect of time on these kinds of beer make the beer very very not good. So, these manufacturers instill in the consuming public this idea that beer, in particular their beer, which represents about 90%+ of the beer sold in the United States, goes bad – the implied, or rather the un-corrected general implication, is that all beer goes bad since, after all, 90% of the beer sold in the United States will. There are some styles, however, that hold up very, very well over time. Like a fine wine, these beers can change their very nature over the course of time and become much more complex, much more developed, much smoother, much richer. Which brings us to our second question: what is the effect of aging. First, it is important to know what is in a beer bottle. Beer, duh. But let's look a little closer at what is in that bottle. Water. Malted barley and other grains. Hops. Yeast, in suspension in the beer, but also, possibly, on the bottom of the bottle [ed note: if the beer is bottled with a small portion of active yeast to aid in the conditioning and further fermenting of the beer, the label will often denote this as a "bottle conditioned" beer]. And, in addition to the ingredients that are in the beer, there is one more thing in the bottle and one more thing on the bottle that impact aging. Headspace and a cap, respectively. Each of these items affects the effect of time on that beer. So, what happens to a beer over time? Well, much the same things that happen to beer before it hits the bottle. It continues to ferment on yeast; it continues to steep in its base ingredients. If the water is poor quality, the poor quality will become more pronounced. If there is oxygen in the headspace or the cap is not on tight, the beer will oxygenate. But the two biggest actors on the aging of beer are yeast and alcohol. "More alcohol means there's more sugars and flavors that can evolve." [cite] "If there is yeast in the bottle, that's good. The yeast will continue its fermentation for a few years, changing the existing flavors and adding new ones, before it dies out and adds its own taste, a biscuity flavor found in old Champagnes, [Brooklyn Brewery, Head Brewer Garrett] Oliver said." Hops present an interesting issue: while in fresh beer they provide a bright bitterness and delicious aromas, these are relatively short-lived effects. Over time these effects will decrease significantly. In the place of bitterness and, to some extent, aroma the beer will "steep," much like tea leaves. But this effect can be volatile – in some cases bringing in the grassiness of the hops, in others simply turning overly sharp like an 'over-steeped' tea. One final note before we get to how: beer that is pasteurized will not age. Great. This is all great! How do you start aging your beer? Well, BeerAdvocate has a great article about aging beer. Basically: keep the bottles out of the light, in temperature-stable areas that stay at about 65 degrees. Cellars, unsurprisingly, are very good at this. It is generally recommended that you keep the bottles upright ("Long storage of a beer on its side can create a yeast ring (or water-mark) inside the bottle, which will not settle. Storing a beer upright will ensure that the yeast compacts to the bottom of the bottle." And "The upright storage method decreases the amount of exposed beer thus slowing oxidation of the beer.") Personally, I have a cabinet in an out of the way place in my apartment that I've commandeered for beer-storage purposes. Hopefully your significant other, if applicable, is as patient and indulgent as mine. Summary: I still have one more bottle to save for some time in the future, maybe 2016. To end your end-of-prohibition day news, two miscellaneous items that I found while researching the article published earlier this morning. 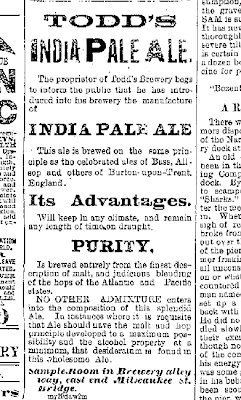 First, an advertisement for what might be the first India Pale Ale produced and sold in the State of Wisconsin. A brewery named "Todd's Brewery" in Janesville, located at the east end of the Milwaukee St. Bridge produced an India Pale Ale and ran advertisements all during the summer of 1884. The second item is a letter, poem actually, to the editor by one "M.W.". This letter was published in the Wisconsin State Journal, Friday, July 8, 1932 - remember the repeal of prohibition is beginning to look certain at this point. that stood there so brazen and cold. when that old brewery was running full blast. on account of the manufacture of your whiskey, wine and beer. with the selling of your booze. and we will cause misery and suffering untold. by causing the driver to run wild. But what care we for the lives of man, woman, or child? I will soon have this old brewery running full blast. if I can fill my coffers to the brim? As an end-of prohibition day special, I just couldn't resist linking to this article from HistoryNet. An excellent article about Prohibition and all of the attendant stupidity can be found here. - "The Pilgrims drank so much beer on Mayflower that they’d almost run out by the time they reached America, and they may have landed at Plymouth simply because they didn’t have enough beer to fuel the search for a better place. 'We could not now take time for further search and consideration,' one passenger wrote, 'our victuals being much spent, especially our beere.'" - And, if you want to know the first American Beer Cocktail - beer (either ale or lager, probably depending on where in colonial America you were and whether the town was English or German), molasses and rum: "Among the most popular concoctions in colonial-era taverns was a drink called 'Flip.' The bartender filled about two-thirds of a mug or pitcher with beer, added a dollop of rum, sweetened the cocktail with sugar, molasses or dried pumpkin and then stirred it with a red-hot poker, which made the drink bubble, gurgle and steam." - "By then [the 1790s], nearly every American farm contained a sizable apple orchard—not to make apple pie but to make hard cider, which was the country’s most popular beverage, guzzled daily by young and old alike. 'In rural areas, cider took the place not only of wine and beer but of coffee and tea, juice and even water,' wrote culinary historian Michael Pollan. 'Indeed, in many places cider was consumed more freely than water, even by children.'" - "Paine’s Celery Compound, advertised [in the late 1800s and turn of the century] as a 'Nerve Tonic and Alternative Medicine,' contained a mere 21 percent alcohol, but the booze was fortified by a dose of cocaine, which no doubt contributed to its popularity." - "Part of the popularity of patent medicines was their appeal to a growing segment of the American population—prohibitionists. In fact, a patent medicine called 'Old Dr. Kaufmann’s Great Sulphur Bitters,' which contained 22 percent alcohol, targeted prohibitionists with ads featuring an endorsement by Mrs. S. Louise Barton, 'An Indefatigable and Life-Long Worker in the Temperance Cause.'" - "The [original attempt at a prohibition] amendment failed in 1914, but gained strength during World War I, when the league exploited America’s anti-German hysteria by deliberately associating beer with German-American brewers. 'Kaiserism abroad and booze at home must go,' declared the [Anti-Saloon League]’s general counsel and wily Washington lobbyist, Wayne Wheeler." - Some great imagery: "'There is as much chance of repealing the Eighteenth Amendment,' said Senator Morris Sheppard, 'as there is for a hummingbird to fly to the planet Mars with the Washington Monument tied to its tail.'" - "We drink a beer while eating a hot dog at baseball games and sip a Bloody Mary while tailgating at football games. World Series winners celebrate by pouring champagne over their teammates’ heads. And stock car racing—which came into its own as a sport after World War II—was created by moonshiners. ... Moonshiners souped up their cars so they could outrun federal 'revenuers' on twisty mountain roads and, in the 1940s, the National Association for Stock Car Auto Racing began organizing races on dirt tracks. 'About all your good dirt track drivers were involved in moonshine,' Junior Johnson, the famous NASCAR driver, told me in an interview in 1999. 'That’s kind of the way it started.'" December 5, 1933. Seventy-five years ago. The day that Utah (Utah!) became the 36th state to ratify the 21st Amendment repealing prohibition. Before prohibition, at the end of the 1800s and into the early 1900s, Wisconsin was home to well over 200 breweries; Milwaukee alone was home to more than 40. But one brewery in particular, founded in 1851 and finally locked and closed 107 years later in 1958, has an ignominious history, inextricably linked to Prohibition. For while the brewery existed for 107 years, including the period of Prohibition, it only brewed for 105 of those. In 1931, Eulberg Brothers Brewery based in Portage, WI was raided by federal "revenuers" and shut down for illegally brewing during Prohibition. It would re-open in 1933 when Prohibition ends. Prohibition began in 1919. How could a brewery, a relatively large building, go unnoticed operating for so long? Brewers in Wisconsin were allowed to make "near beer." When prohibition began the law criminalized the production of any beverage exceeding .5% ABV; later this limit was raised to 3.2%. Through the use of de-alcoholizers, breweries could remove the alcohol, and unfortunately most of the flavor, from beer. Many breweries, including Potosi and Hausmann tried to continue operations selling "near beer." While Potosi managed to limp along, Hausmann closed in 1923. In 1933, when Prohibition ended, only 79 breweries resumed operations; over 130 breweries had closed and ceased operations. Of course, the small breweries that had re-opened were unable to compete with the largest breweries that had re-opened: Miller, Schlitz, Pabst, etc. By 1972, 39 years later, only 8 breweries would remain in the State of Wisconsin. Other breweries just illegally sold the real deal. The production of "near beer" only tells part of Eulberg's story, though; Eulberg was only licensed for "near beer" until 1924 when its license was revoked and it was fined $1000 for also selling "real beer." But the revocation of the license didn't stop Eulberg. The reality was Eulberg Brothers was also a maltings, a facility for malting barley, and it used this cover as a front for its now-illegal "real" beer production. In 1844 a man from Hesse-Darnstadt, Germany by the name of Jacob Best founded a brewery in Milwaukee that he called initially Empire Brewery, but because of all of the breweries named Empire Brewery renamed his brewery "Best and Company." In 1848, Bavarian Frederick Adam Sprecher founded Sprecher Brewing Company at the corner of Willy St and Blount in Madison. In the next few years, Mr. Sprecher's brother-in-law, also from Hesse-Darmstadt, Germany, would come to Wisconsin and open his own brewery in Portage, WI. This man was Karl Haertel and he found Haertel Brewery in Portage, WI in 1851; Haertel would later be branded under the name "City Beer." This same year, his emigrant-city-mate Jacob Best would brew 225 barrels of beer in Milwaukee. In 1859, Frederick Adam Sprecher would die and send his brewing operations into disarray for a few years. In 1862, Jacob Best dies and his sons, Jacob, Jr, Phillip, Charles and Lorenz take over ownership (control had passed in 1853 when Jacob, Sr. had resigned to become involved in politics). However, it quickly becomes obvious that Phillip is running the show, and Charles leaves to found Plank Road Brewery, also in Milwaukee. Plank Road Brewery would eventually become Miller Brewing Company. By 1864, "Best and Company" was now "Phillip Best and Company" and was brewing 4900 barrels of beer a year. But in 1866 Phillip Best abruptly dies. While Junior sticks around and helps to run it, Phillip's son-in-law, Captain Frederick Pabst takes control of Phillip Best and Company. In 1889, Capt. Pabst would rename Phillip Best and Company, nee Empire Brewing, Pabst Brewing Company. In the meantime, in 1868, Karl Haertel's other brother-in-law, a Bavarian named Peter Fauerbach purchases Karl Haertel's recently deceased brother-in-law's brewery, Sprecher Brewing Company and renames it Fauerbach Brewing Company. A few years later, with Karl approaching old-age, his daughter marries a brewer from Milwaukee named Jacob Best, Jr. Junior takes over operations of Haertel Brewery in 1876. By 1880, Jacob, Jr. had Haertel Brewery pumping out about 3,000 barrels a year. But, Jacob was growing tired of the brewing and he, and his wife Elizabeth Haertel sold the brewery in 1884; while Junior leased the facility out to the new brewers, control completely left the Haertel clan in 1894. The purchaser was a brewer who had gotten his start in Dubuque, Iowa and Mineral Point, Wisconsin named Peter Eulberg. Peter purchased Haertel with his brother, Adam and together they ran Eulberg brewery until 1895 when Peter died. In 1901, Peter's brother Adam died and the Estate of Adam Eulberg ran the brewery for a number of years until 1907 when Adam's sons (Jacob, Julius, William, and Joseph) purchased the brewery from the estate. As mentioned above, the Eulberg Brothers ran the brewery, with its best brand "Crown Select" until 1919 when Prohibition required that the Eulbergs install de-alcoholizers. Eulberg remained licensed to sell "near beer" until 1924 when its license was revoked and the brewery was fined $1000 for selling "real beer." Most breweries would have stopped brewing. But not Eulberg. The brewery was also a malting facility and Eulberg would malt grains grown in the area for use by other breweries. This malting acted as a cover operation for bootlegging until 1931. A certain man, in a certain local hotel, has not suffered greatly from the heat. Refusing to leave the hotel during the heat wave, this man has lounged about his room in scanties since the torrid spell began with an electric fan in operation and with a bathtub - full of beer on ice at his side. Whenever his stock becomes depleted, he sends out for more beer to refill his bathtub. This man's room has become a mecca for heat relief seekers, it is said. Wednesday, July 1, 1931, Afternoon Edition, pg. 10. I love that not only did "a certain man in a certain hotel" do this, but that it was newsworthy. It was a day that my Cleveland Indians lost to the Philadelphia Athletics 11-7; future hall-of-famer Earl Averill hit a two-run homerun, and two others had two RBI each - in fact, only the Phillies' shortstop did not have an RBI against the luckless Indians that day. Federal prohibition officers raided the plant of the Eulberg Brewing corporation here today, arrested three workmen and seized a quantity of beer. Warrents charging the officers of the corporation with conspiracy to violate the federal prohibition laws will be sought, the agents said. They reported seizure of 315 barrels of beer in vats, six barrels of the finished product, thirty-one half-barrels, twenty-four quarters, and 4,000 pint bottles of brew. The Capital Times noted on July 1 that "It is reported that many Madison speakeasies have been selling alleged beer from the Eulberg brewery for the past two years. The action of the federal officials is expected to cause a temporary 'drought' here." The three corporate officers charged were Eulberg brothers Julius and Joseph and brewmaster William Broeske. That Friday, July 3, all three posted a bond of $2,000 (about $27,000 in today's money) each. A hearing was set for July 29; that hearing was subsequently postponed. On February 20, 1933 Julius and Joseph were both convicted and sentenced to six months in prison by a Chicago federal court. Julius' sentence was immediately suspended for three years - he would never have to serve time, as prohibition ended the following year. Joseph was granted a ten-day stay, during which time he would apply to President Hoover for a pardon. Joseph's pardon was not granted, and on March 1, 1932, a year and a half before the end of federal prohibition, Joseph Eulberg was sent to a Milwaukee prison to serve his six-month sentence. After a mere eight days, with prison life not sitting so well for Mr. Eulberg, he again asked President Hoover for clemency. Joseph Eulberg was released from prison in September of 1932. During this year, 1932, tremors started in the industry that prohibition would be repealed. Breweries started to removed their de-alcoholizers and started taking orders, automobile factories started producing heavier duty trucks, glass companies started churning out more beer bottles, even crate makers started ramping up production of beer cases. In fact, the posh Drake Hotel in Chicago, built during prohibition, was getting together funds to purchase a bar, since one had never been installed. Anticipating the return of beer, oldtimers who enjoy the beverage are looking forward to the day of the schooners. They still have recollections of the "good old days" when they were able to buy a glass of beer for five cents and eat all the free lunch they could consume. ... There is a possibility that if beer is legalized by Congress that it will be sold in restaurants. That means no free lunches will be provided. ... Madison once had about 90 saloons every one of which served lunches with beer. ... Before Congress deprived the beer drinkers of their favorite beverage, Madison supported three breweries. Fauerbach's is the only brewery now in operation. The other two were Hausmann's on State St. and Breckheimer's on King. Haumann's also operated the malthouse on Sherman Ave. This was known in early Madison days as the Rodermund Brewery. ... Many people delighted in taking Sunday walks out Sherman avenue and dropping into the malthouse where they drank several beers, chatted about old times, and then resumed their journeys. ... We also remember the days of the Oster Brau which was manufactured each spring by the Breckheimer Brewery. Some of the patrons of the Breckheimer Saloon still have the taste of this brew in their mouths. ... Hausmann's barroom was a popular place for university professors and students who loved their beer. ... It is expected that as soon as Congress puts its OK on the manufacture and sale of beer , Fauerbach's will begin to turn out the old style brew again. ... On the east and south ends of the city were maintained both "First and Last Chance" saloons. By coming into the city, people were confronted with signs reading "First Chance." Upon leaving they were informed by signs dangling in front of the same places that it was their "last chance." With the ushering in of FDR and The New Deal in 1933, the repeal of prohibition picked up steam. As of June 18, 1933 with repeal looking certain, The Wisconsin State Journal reported that our heroes, Eulberg Brewery in Portage were granted a license to begin brewing "real beer" again; 52 breweries had thus been granted new brewing licenses - another 25 would be granted licenses by December 5. Finally, on December 5, 1933, Utah ratified the 21st Amendment repealing prohibition. While the beer industry is again exploding with new breweries. By the early 1980s, only 7 breweries remained in the state of Wisconsin. Eulberg resumed brewing in 1933, its most famous beer being branded "Crown Select." The brewery was sold only 11 years later, in 1944, to two gentlemen from Waukesha named Lawrence and Alvin Bardin. In 1958, Alvin and Lawrence closed down the brewery in Portage and moved the brand to a contract brewery in Waukesha. In 1960 they ceased selling beer under the Eulberg name. The old Haertel/City/Eulberg brewery no longer exists; in its place is the Portage Chamber of Commerce building. No podcast this week. The audio folks were spread across the states celebrating Thanksgiving with their families. Selfish bastards. Tune in next week when they redeem themselves with an awesome interview with Ale Asylum's Dean Coffey. Flavor: roasted chocolate; if you took a chocolate bean and put it in a 400 degree oven for 10 minutes it might smell like this; if said oven was coated in peat; if you took a whole bunch of these beans, steeped them in a water and added some cream for body, well, it would probably taste really nasty. This is the exact opposite of really nasty. Sorry, no eloquent waxing about the history of style today. For a variety of reasons, all we'll do today is a guest review the latest New Glarus Unplugged beer, the Apple Ale. A few years back New Glarus regularly brewed an Apple beer in addition to their world-famous Wisconsin Belgian Red (Cherry) and Raspberry Tart. My sources all tell me that 3 of them didn't sell well, and while the apple was generally considered to be the best of them, it was also the most expensive, so it got axed. What is unclear is whether this recipe is the same as the old apple recipe, or whether this is entirely new - I wasn't around when that first apple beer was. So, if you know this answer or who would like to reminisce about that old apple beer, feel free to comment. Summary: could definitely get drunk on these without ever realizing you're drinking beer; me like it.